It was as it had always been. The Eternal Strife, constantly warring, constantly struggling. For the Great Powers of existence came in pairs, equal and opposite. As there was light, darkness also existed. Where there was order, disarray struggled against it. Where there was good, evil flourished. And this harmony in the heavens passed for an eternity, time beyond all comprehension, all the while struggling. These Forces were all of existence, and all of existence was these Forces. They each claimed a portion for themselves. Good opposed evil, law opposed chaos, and all met in the center, where balance prevailed. 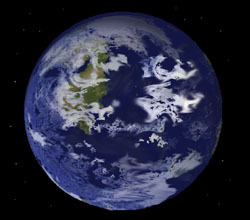 These divisions of the universe, where one force prevailed over the others, became part of the Great Sphere. Nine divisions, eight sections of power, surrounded by the center. Millennia ago these inexorable forces begat spiritual places, and they were called planes of existence. 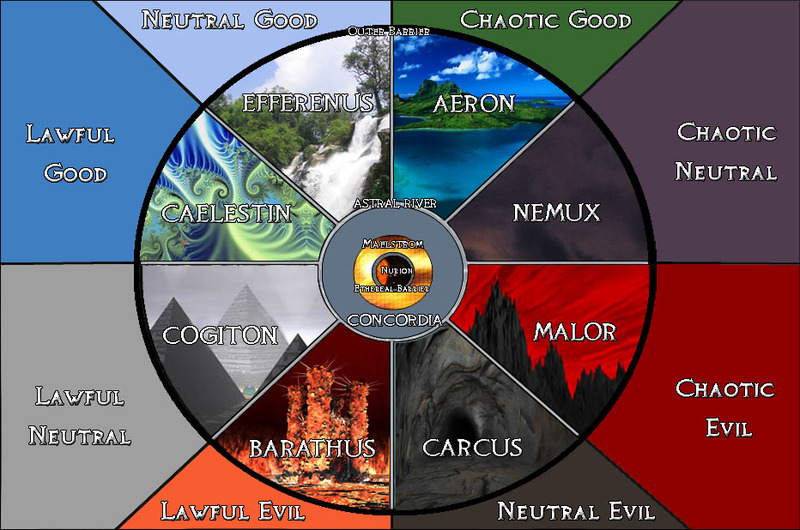 Heavenly Caelestin opposed evil Malor, orderly Cogiton opposed chaotic Nemux, passionately good Aeron opposed Hellish Barathus, and beautiful Efferenus opposed hopeless Carcus, all circling around the Concordia, the great balance. In the middle of the Concordia, at the center of the sphere, was all of the non-spiritual matter of the Multiverse. Untold eons of friction, of the ceaseless pushing of these cosmic Forces, pressed the Concordia, creating at its center a great Maelstrom of heat and pressure. And the heart of this Maelstrom of Friction condensed into a diamond of perfect beauty, flawless and unspoiled: the Lifestone of the Universe. And seeing the beauty of this gem, the Forces changed. These once mindless Powers now knew desire, desire for this perfect gem. These desires slowly personified into creatures, mighty sentient beings with full-fledged emotions and minds of their own. And the Concordia simultaneously gave birth to a protector, a god whose sole purpose was to guard the gem. This being, called Dekk, was the strongest of all. Hence came to be the nine original gods of the Universe. Caelestin begat Heshtail, Efferenus begat Bestra, Aeron begat Kantor, Cogiton begat Neltak, Nemux begat Bel, Barathus begat Lagur, Carcus begat Grlarshh, and Malor begat Soggoth. As each of these creatures came to be, the desire in their hearts was kindled, and they wanted the gem. And beholding this gem, something else became apparent-- although the stone was beautiful beyond compare, it was also the key to more, to the cessation of the perpetual cosmic struggle which burned within each of them. The want of the Lifestone grew. This desire became passion, this passion became anger, this anger became rage. And thus began the Ontological War. Each of the gods desired the Lifestone, working to take it for his or her own. Knowing that they would be unable to wrest the stone directly from Dekk, as he was the most powerful of all of the gods, being the protector, the gods perceived that they must each defeat the other gods first, usurping their space in the Multiverse, to grow in power. As they absorbed the power of the other gods, they would be able to challenge Dekk and defeat him, claiming the Lifestone for their own. Bel was the first to act: the nimble rogue attempted to steal Neltak's great axe. But Neltak saw him and struck out at him, meaning to end his life and take his power. The blow was true and would have killed Bel, but Dekk would not permit one Force to seize another's place, and he stopped the strike the only way he could: he interposed the Lifestone itself, using its powerful force to stop the blow. But the axe struck true, the edge bringing a small crack to the once perfect surface of the shining gem. Grlarshh cast a plague on Bestra, who struck back with a tremendous bash of her mighty shield. But Dekk was again there, stopping the power of Grlarshh's plague and Bestra's shield strike with the Lifestone. Once again, damage was done; Bestra's shield created ripples on the surface of the stone, while Grlarshh's plague left spots of disease on the once shining jewel's face. Soggoth lashed out at Heshtail, his tentacles trying to rip Heshtail in twain. Heshtail met force with force, his staff deflecting Soggoth's blow, but shattering into many shards. Dekk intervened again, placing the Lifestone between the pair, Soggoth's spiny tentacles leaving a long mark on the gem, Heshtail's staff leaving splinters all through the gem. Lagur and Kantor warred with each other, each believing that they could defeat the other with but a single blow. They each mustered all of their power, lashing out at their opposite, only to be blocked once again by Dekk and the Lifestone. But again, the blows struck true. Kantor's axe sundered the gem, leaving a large crack, while Lagur's trident pierced it to the core. And thus rebuffed, each god returned to his or her place. It was Soggoth who secretly summoned the gods of evil together, seeing that no headway was made in their quest for the gem. It was he who suggested a union, a sacrificing of powers to create a great one, one with the power to defeat Dekk and wrest the Lifestone from his grasp. Each of the gods of evil agreed to give up a portion of their essence, a piece of their power and dominion, to create a master, the Lord of Evil. From this joining of wills sprang Vornoth, who was named the Walker in Darkness, for he could travel through any of the planes of evil at will. And the strength of Vornoth was great. And the gods of evil reveled in their creation and lent what aid they could to Vornoth, in hopes that their new master would be able to wrest the Lifestone from Dekk. Seeing that the Lifestone was to be stolen away by the powers of evil, the gods of good one by one came to Dekk's aid. But lo, their strength was not enough, for Vornoth met them each in turn and bested them, and Dekk knew he would lose the battle. Fearing that all was soon to be lost, Heshtail cried out for aid, willing the Good Alignment Forces once again to personify in an effort to save the Lifestone from falling into the hands of evil. And his call was heard. The Forces again spawned three strange creatures of power, beings as mighty as the gods themselves: Tal-Allustiel, Khuldul Rockcarver, and Bunga Proudfoot. Each of these new gods lent their aid to the forces of good, and the balance again shifted. Concordia retained dominion over the Lifestone. But Dekk was distraught, for the war of the gods had devastated the once perfect gem, leaving naught but a broken piece of rock in its place, flawed, irregular and imperfect. Unwilling to see any further destruction to his beloved jewel, he called for a halt to the hostilities, for a gathering of the gods. Hence began the Council of the Gods. The council of gods lasted many ages, with talk about what could be done to save their precious Lifestone, the gem they all craved so much. Khuldul Rockcarver was assigned the task of repairing the gem, for he had great skill in working with gems of all sorts. Many ages he labored on the Lifestone, fixing some of the damage, but much of it was beyond his ability to repair. Much of the harm done during The Ontological War was irreversible, a permanent mark left by the gods. Where Neltak's axe had struck, mountains had formed. Where Grlarshh's plague had spread, now barren desert stood. Where Bestra's shield had struck, a multitude of hills had formed. Where Heshtail's staff had shattered, great trees now stood; where Soggoth's tentacles had gouged, rivers now flowed. Where Lagur's trident had pierced, caves and deep tunnels now stood, and where Kantor's axe had cut, great seas had formed. And though this gem was no longer perfect, they still had a great desire for it, perceiving again that it was somehow the key to ending the war once and for all, and they named it Núrion, the Shattered Jewel. Many things came from the Council, designed to prevent any further damage to Núrion the beloved. Seeing the destruction wrought by their strikes, each of the gods agreed never again to touch the gem, for fear they may further damage it. And out of fear of Dekk's power, the other gods cried mightily, for there could be no balance where one god had more power than others. In the interest of neutrality, Dekk agreed to give up a portion of his own life essence to Núrion itself. To keep the balance, Dekk created two great entities, Tanarus and Sulis, which gave sentience and life force to the shattered jewel. And Dekk created the Universe Shell as a case for the gem, and he pierced the shell in many tiny spots to let light into its dark hollow space. As the universe created all things in pairs, so the gods felt that they should be in pairs as well. Each god created his or her own helper, an aid of sorts, a creature of lesser power who could further the aims of his or her master and who was not constrained from touching the gem. And secretly the gods hoped that these lesser beings could grant them aid should the Ontological War be rejoined. Heshtail begat Reeanan, Bestra begat Calbran, Kantor begat Thranton, Neltak begat Aknor, Dekk begat Janora, Bel begat Flamgart, Vornoth begat Bemit, Soggoth begat Yorsot, Grlarshh begat Tormossh and Lagur begat Nij. Of the latter gods, Khuldul Rockcarver begat Dhurli Ironbeard, and Bunga Proudfoot begat Bucca Tunnelly. Only one god refused to make a single helper. Tal-Allustiel the farsighted refrained; instead he created several creatures, immortal, of insignificant power when compared to the gods, yet he prophesied that they would be a great helpmeet. He named his creation the Elhil, the Firstborn, for he sent them directly to live on the beloved rock known as Núrion, and they were the first creatures to live thereon. Frustrated at his inability to gain power on this world and longing to wrest control of it, to have it for his own, Vornoth planned the ultimate evil act-- betrayal. So like Heshtail, he secretly called upon the evil ontological Forces for his own advantage, and they gave him the knowledge and the power to craft a receptacle, something that could store and magnify evil powers. And thus Vornoth summoned the gods of evil together once again. Reminding the group of the success they had had in the past when they had joined forces and noting the new threat posed by the number of good gods, he implored each of the group to again surrender a small portion of their power to create an artifact, an item imbued with the power of the eight gods of evil. This artifact, this spiritual tome of power, would allow them once again to establish their dominance over the gods of good. And in their greed and lust for power, the gods of evil agreed to his request. But Grlarshh the wily overheard Vornoth mutter to himself about the Book of Seven, and he reasoned that this name did not make sense if it were to contain the life force of eight gods; it should be called the Book of Eight. And he told Soggoth of his suspicions. Yet Soggoth was a liar, and he thought all others were liars. And thus he mistrusted Grlarshh, but he placed a piece of his life essence, a tiny echo of his will and existence, into a small gem, the Ruby Skull, as a small hedge against the possibility that Grlarshh spoke truth. But Grlarshh grew more certain in his mind of the betrayal, and therefore he withheld his whole power at the last moment. And he was right to do so, for Vornoth indeed deceived them all. In an effort to make a true artifact of power, Vornoth against the agreement took the entirety of the life essences of the gods that had submitted, absorbing them into his book, the powerful Book of Seven, named thusly because it was intended to contain the life forces of all of the evil gods save Vornoth. The seven gods disappeared, entirely slain and absorbed into the book, or so the Walker thought. Vornoth then gleefully attempted to use the book to take control of the Shattered Jewel. But it was somehow incomplete and would not function! Bewildered, Vornoth sought the cause, and he soon discovered that Grlarshh had deceived him and fled during the ceremony. He grew very angry and went to strike against him, but he was unable to do so, for two of the gods of Neutrality-Dekk and Neltak- had given him sanctuary, protection from the evil that was his former master. And Dekk, Neltak, and Grlarshh used their power to claim a small piece of Carcus and hedge it against the Walker's might. Yet Vornoth vowed that he would see Grlarshh slain. The first 100 years the elves lived alone, exploring their new home. It was then that Tanarus and Sulis each used their power to create the beasts of Núrion, creatures to share this planet with the elves. They created these creatures in many types, and they lived in peace and harmony with the Elhil, for the elves were their equals. An eon passed, and Tal-Allustiel developed a special bond with his children the Elhil and saw the potential within them. Yet he also saw that they were incomplete. Once again, Tal-Allustiel poured his life essence into the Elhil, providing to them a great gift, the gift of speech. This mighty boon allowed the elves to better work together, and the power of the united elves quickly separated them from the animals. And the Elhil praised him for this mighty gift. As Tal-Allustiel poured his life force into the Elhil, Vornoth rejoiced, knowing that by doing so, the god of elves was giving up some of his power, his life force, possibly enough to shift the great balance into the favor of the evil god. However, something happened that Vornoth did not expect. As the Elhil raised their voices in praise of their might god, they somehow channeled to Tal-Allustiel the energy of the great Maelstrom that surrounded the universe of Núrion. And lo, the elf god grew even greater, more powerful than he had been before. And the other gods understood now why Núrion was the key, and seeing the added power that this worship created, they became jealous, all of them wanting creatures of their own to provide them with adulation and the additional power they so craved to bring an end to the eternal strife. Yet they had no desire to give up so much of their life essence to do so. Khuldul Rockcarver found another solution. Pulling from the essence of the very rock of Núrion itself, he began his greatest work. For an eon he worked at his forge, creating creatures in his likeness, using the heartstone of a great mountain in his forging, and the mountain in which he worked was named Mt. Creation. After many years and much hard work, he completed his labor. Ten creatures he created, strong and durable as the stone they were created from-five males and five females, the first of the dwarves. One of the greatest of the first Elhil was Talkana Silumiel, a beautiful and powerful priestess of Tal-Allustiel. She was also a student of the elves' fledgling art: the channeling and manipulating of the energy of the maelstrom, an art that became known as magic. And in this art too Silumiel would gain great renown. For many years she traveled, instructing the Elhil and the dwarves in the ways of speech and worship, encouraging the Elhil to explore the world and bring knowledge and language to all who dwelt on Núrion. But it was through her travels and exploration that she began to crave power, wanting more than she had, more than Tal-Allustiel was willing to give. After many years of searching for power, she came to meet with Vornoth, and made with him a pact. In exchange for power unlike any creature of Núrion had ever known, Talkana was to betray her people, giving herself and nine of the Elhil unto Vornoth, providing these ten with the power unknown to them. And at this act, Silumiel's form of grace and beauty fell from her, and her outward visage changed to match the corruption of her soul. And Vornoth was pleased. Then Vornoth took the ten Elhil, and the other nine he tortured, twisting them to forms that pleased him, forms that echoed Silumiel's corruption. Warped and perverted mightily, these other nine creatures no longer possessed the immortality of their Elhil brethren but instead had great fertility, the ability to reproduce in such numbers that they could quickly overwhelm their foes. And thus were born the race of orcs, creatures of great fecundity perverted for the sole purpose of destroying the elves and worshipping Vornoth. Seeing the creatures created by Vornoth, the other gods grew in fear, for they quickly saw the balance shifting towards evil. Joining together, the gods agreed once again each to give up a small portion of his or her life essence to create new creatures, creatures destined to once again restore balance to Núrion. Fearful of putting too much of their own power into the creations, each of the gods of good and neutrality-Heshtail, Bestra, Kantor, Neltak, Bel, Dekk and Bunga Proudfoot-created creatures in their image. Each of the gods created only two creatures, but they poured into them the ability to adapt, the will to change, and the desire to succeed. And thus were born the first of the humans and halflings, creatures placed by the gods on Núrion for the sole purpose of stopping the orc menace and once again restoring the balance. Such was their concern for their own power, the gods did not instill these creatures with the same power with which Tal-Allustiel did the elves. Adaptable as they were, they were not immortal. Once they were created, the humans were not bound by their god's will as were the Elhil. They were free creatures, able to choose their own paths, their own destinies for their own purposes. Uneducated, uncouth and uncivilized, at first these creatures were little more than the animals created by Tanarus and Sulis, doing hardly more than surviving and reproducing, with no direction. After many eons of living as the animals, the gods despaired, for it appeared that these wretched creatures would never rise up to be the saviors of Núrion that they were created to be. It was then, at the direction of Tal-Allustiel, that the Elhil gathered some of them together and taught them. They tutored them to speak in something more than the primitive grunts and gestures they then employed, they taught them how to cultivate the land, and they taught them how to live and work together. And eventually through the combined efforts of the humans and elves, the first human kingdom was built: Aelfar the Ancient. And the battle of history was well and truly joined.